Polishing metalwork is a very time consuming process, especially with harder metals such as stainless steel, but the results more than justify the time taken. The process begins by grinding away any unwanted hammer marks or texture with progressively finer abrasives. After being ground, the metal is buffed using cotton polishing wheels and highly refined abrasives known as buffing "soap". This step tends to smooth out the metal's surface rather than grinding it away. The final stage is to bring out the rich character and colour of the metal by polishing it with jeweller's rouge. Hammer marks on forged metalwork act as witnesses to its bespoke and handmade nature and can be expressed, rather than removed, on selected work. They are left on show but any smaller and unwanted marks are ground away before the metal is given its final polish. 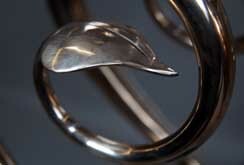 The finish is a "polished-smoothed-forged look". It's somewhat difficult to describe but the bronze strip in the bowl in the left hand picture above nicely illustrates it. Polished and contrasting metals feature in much of our portfolio.